John Fisher, associate professor in the Fischell Department of Bioengineering, won the Best Inventor Pitch at the 2009 Bioscience Research and Technology Review Day with a tissue engineering bioreactor system that grows bone and other types of tissue for implantation. Fisher's technology was one of six innovations presented in an eight minute pitch by faculty members and graduate students at the Professor Venture Fair, held November 12 at the University of Maryland. "Dr. Fisher impressed the judges with his clearly defined product--the bioreactor system itself--and his ability to position himself within an already vibrant tissue engineering marketplace," says Gayatri Varma, executive director of the university's Office of Technology Commercialization. Fisher's novel, patent-pending bioreactor system makes tissue engineering more efficient by addressing many of the shortcomings of available systems, such as the high cost and complexity of the perfusion chamber and the low output of the rotating flask. His approach exposes growing tissue to an increased amount of oxygen and nutrients, making it a more prolific and cost effective bioreactor than those currently on the market. Fisher, along with graduate student researcher Andrew Yeatts and undergraduate student researcher Elyse Geibel, both from the Fischell Department of Bioengineering, have already created a prototype in the lab using off-the-shelf products. Fisher plans to start a company to bring the bioreactors to a commercial market. 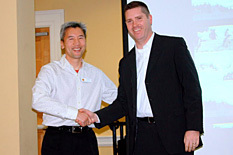 "We're thrilled to win the Best Inventor Pitch for Bioscience Day 2009," says Fisher. "It is a fantastic opportunity to be able to describe our work and concept to local venture capitalists. We hope to use this award as a springboard to launch our company, ProlifiTEC." "Super Fiber for Human Health," Lucy Yu, professor in the department of nutrition and food science. The annual Biotechnology Research and Technology Review Day Professor Venture Fair is hosted by the Maryland Technology Enterprise Institute (Mtech), the Office of Technology Commercialization, and the College of Chemical and Life Sciences. The pitch competition encourages scientists to consider the commercial potential of their work and challenges them to translate their ideas to a general, non-technical audience. This year's Professor Venture Fair was sponsored by the Maryland Technology Development Corporation (TEDCO). Both past winners in the fair's relatively brief, three-year history have gone on to create successful start-up companies. Last year's winner, Matt Dowling, had already started Remedium Technologies in 2007, and the company, now in the Mtech VentureAccelerator Program, continues to develop its Velcro-like biomaterial bandages. Lawrence Sita, the 2007 winner, started Precision Polyolefins, a company that could revolutionize the plastics industry by introducing a clean alternative to existing methods of plastics production. "Investors can find it difficult to navigate the wealth of research at universities to pinpoint a major market winner," says Dean Chang, director of Mtech's venture and education programs. "These Faculty Venture Fairs bring together innovative academic researchers, venture capital firms, and university entrepreneurship organizations to ensure that the best inventions on campus will have a good chance of finding their way out of laboratories and eventually into the market." Judges for the event included Jeff Auerbach of Edell, Shapiro & Finnan; Jeff Davis of Medimmune; Robb Doub of New Markets Growth Fund; Christine Copple of Starrise Ventures; Martha Connolly of Maryland Industrial Partnerships (MIPS); and Linda Saffer of TEDCO.